US, 1950, 90 minutes, Black and white. Robert Taylor, John Hodiak, Arlene Dahl, Don Taylor, Jean Hagen, Bruce Cowling, Leon Ames, John McIntire?, Chief Thundercloud. 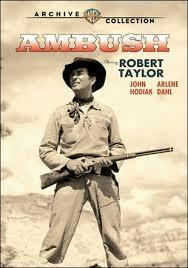 Ambush is a standard western of 1950. With its presentation of the cavalry, scouts and a military outpost in Arizona, it has many resemblances to the types of westerns that John Ford was making at this period (Fort Apache, Rio Grande). However, this is the last film directed by Sam Wood, who gives more attention to the dramatic interactions of the characters than the action – though there is quite some action, Indian ambushes and pursuits. Sam Wood directed a variety of films from A Night at the Opera, Goodbye Mr Chips, For Whom the Bell Tolls. An older Robert Taylor is strong in the central role of the scout. John Hodiak is the straight-up-and-down military officer. There is sympathetic support from Arlene Dahl, looking for her sister who has been taken by the Indians (echoes of the later, The Searchers). Jean Hagen is the sympathetic wife of the outpost bully (Bruce Cowling), involved in a relationship with a lieutenant (Don Taylor). Leon Ames is the sympathetic head of the outpost, John McIntire? a scout. The film focuses on the work of the scouts, the rounding up of the Indians, their rebellion and breaking out. It highlights the nature of the cavalry, the outposts, life there and the tensions, the continued risks with the encounters with the Indians. 1. An interesting western? The role of the Indians, 1950s perspective? The cavalry and outposts? The independent scouts? 2. The black and white photography? The West, the outpost, the mountains, the plains? Authentic atmosphere? The military headquarters? The musical score? 3. The title, the Indians and the ambushing of the cavalry? The cavalry and the pursuits of the Indians? 4. The introduction to Ward Kinsman? His prospecting? The encounter with Frank Holly? The old scouts? The ambush by the Indians, their shrewdness, the shootouts, letting their horses go – taking the Indian horses? The return to camp? 5. Robert Taylor as Ward Kinsman? His age, experience? Independence? His respect for Major Breverly? His clashes with Tom Conovan? Friendship with Linus Delaney? The meeting with Ben Lorrison? With Ann? The mission to recover Ann’s sister? His being wary? Major Breverly and his requests? The issue of the horse and the clash with Conovan? His decision to go on the mission? The attraction towards Ann, knowing her relationship with Lorrison? 6. Breverly, his management of the outpost? Sympathy? His being attacked? His injuries? Lorrison taking over? Young, by the book, inexperienced? The relationship with Ann? The tension with Ward Kinsman? Their going outside the house and the fight? Lorrison’s superiority? 7. Linus and his relationship with Martha? Forbidden on the outpost? Conovan, his drinking, his physical violence? Martha, trying to do the right thing – yet her love for Linus? Her work on the outpost, the laundry? The authorities knowing what was happening? Lorrison and his hard stance? 8. The mission, the pursuit of the Indians? The dangers? The decisions? Kinsman and his attitude to Lorrison? The tactics, the fights? Diablito? His followers? Out from the reservation? The ambushes, the attacks? Lorrison’s death? Frank Holly’s death? Tana and his advice – but sympathies for Diablito? 9. The recovery of Ann’s sister? Her gratitude? The return to the camp? Breverly and his decisions? Conovan and his brawling? Martha and the relationship with Linus? Ward and Ann? 10. Familiar themes, expectations, predictability of some aspects? Yet a competent western, reflecting the attitudes between the whites and the Indians in the 19th century?